I’m afraid instead of getting a nice series of travel updates, you’re getting an entire novel at once. 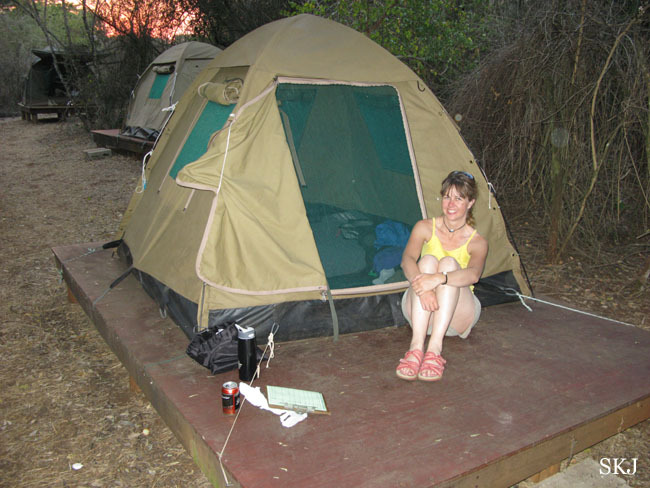 Internet access was not to be had at all during my Earthwatch expedition, where we lived in primitive bush camps. So my entire 16 days of expedition in Hluhluwe-iMfolozi park are rendered in one post; I typed on my laptop in a Word document sporadically while in the field and have pasted here. So you may know that one of the things I’ve been nervous about coming here is the spiders and snakes… many venomous snakes and even more venomous spiders. But I told myself I’m surely exaggerating the likelihood of having to deal with these things. No sooner had we each picked out our tents than one volunteer, Conrad, said, “hey you want to see a big spider?” Our camp manager told us we could call him over to deal with these critters. So I went over to have a look and sure enough, a BIG ol’ spider sitting on the wall of his tent. I have religiously kept mine zipped shut though I know it is really no defense… and I check every nook of my tent before going to bed. I won’t embarrass myself telling you the other things I do to ward off spider encounters. So OK, spider. Bound to happen. No biggie. We’re sitting at lunch chatting away and suddenly the camp manager says, “Snake!” and jumps up and runs over to the barbeque pit. “Yep,” he says, “a puff adder. Very bad.” He then proceeded to explain to us, while trying to coax the snake onto a stick to carry it away from camp, that if you were to get bit by a small one, such as the one in our camp, you would surely lose a toe or finger if you were bitten on foot or hand, and a large puff adder bite would probably result in amputation of an entire portion of your limb. Then he described the ungodly pain that you would suffer….. The puff adder is very camoflauged; he says the way most people get bit is they accidentally step on the snake in the leaves or grass. There was also the shed skin of a much larger puff adder right outside the loo. Lovely. Actually the camp manager (forthwith NCM for North Camp Manager) did not originally spot the snake itself; he had been watching a bird in the trees and noticed it behaving strangely; that tipped him off to look down below the bird and then he spotted the snake. Snakes and spiders aside, we saw some other cool animals today. I really didn’t know how often one could expect to see some kind of animal. But we saw zebras before we even got in the park, and giraffes were hanging out at the park entrance. We were traveling at night from a place where we were meeting with the other half of the EW team staying in the South Camp, and so were given a spotlight to search for animals (a game drive, basically). NCM said we’d surely see many more animals on subsequent drives and was apologetic at the sparseness of critters, but I personally was thrilled. We saw 2 white rhinos, almost majestic creatures with their fantastic horns curving upward from their snouts, and a bunch of hyenas that were so close you could practically reach out and touch them from the truck (open air truck). Saw some other antelope species and some water buffalo and an owl, but the rhino and hyena were way cool to me. 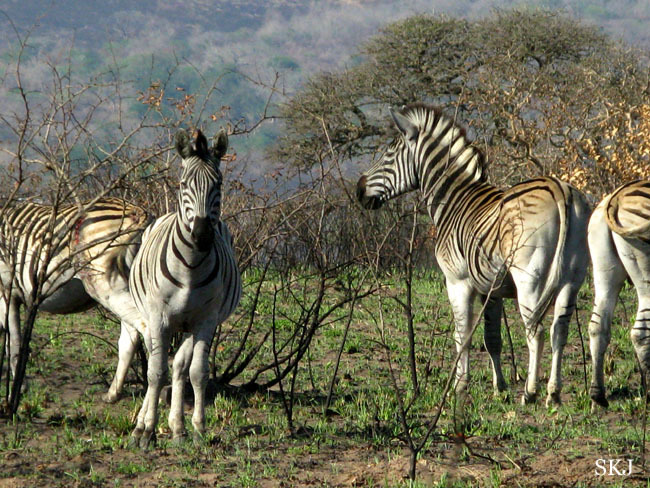 And zebras and giraffes earlier…. I thought it was a great day. It’s a brilliant camp out here in the bush. No electricity at night but we do actually have flush toilets. Showers are an outdoor bucket shower ... hoist a bucket above your head and let the water drain through a shower head; you can customize your water temperature by how much fire-heated water you mix with cold water from the spigot. It’s peaceful and feels very remote. The next day it rained throughout the night in bursts, keeping me awake each time a new shower started drumming on the roof of the tent. NCM warned us that the tents leaked. He was not speaking idly. Among other drips, there were two that came down on either side of my head; the distance between the drip-sites was about exactly the width of my head, so I had to position my head just right to stay between the drips. I thought about turning around, but the sleeping bag on my feet was also wet, so I don’t think it would have helped. When I awoke in the morning, there was a small pond in the corner upon which my plastic baggies of toiletries serenely floated. OK, maybe not quite floating … but there was measurable standing water. We received training in the data collection methods and equipment. Spent first part of day training with rest of the group then came back to our camp and broke into NCM’s beer. 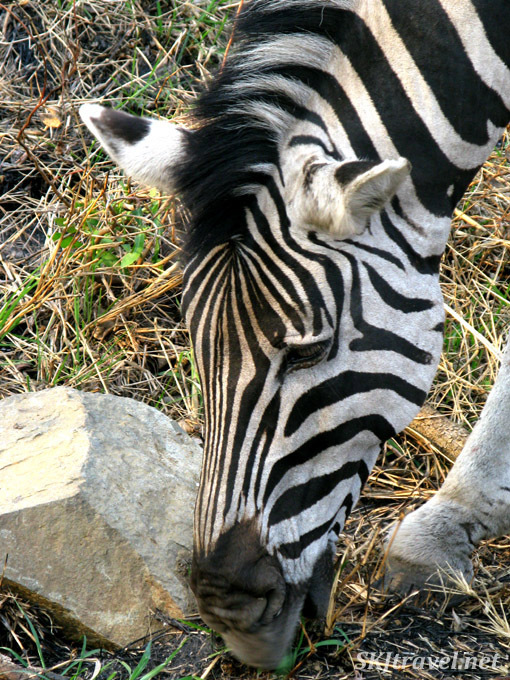 In the dry riverbed just beyond our camp we had zebra, wildebeest, water buck and black rhinoceros wander through. 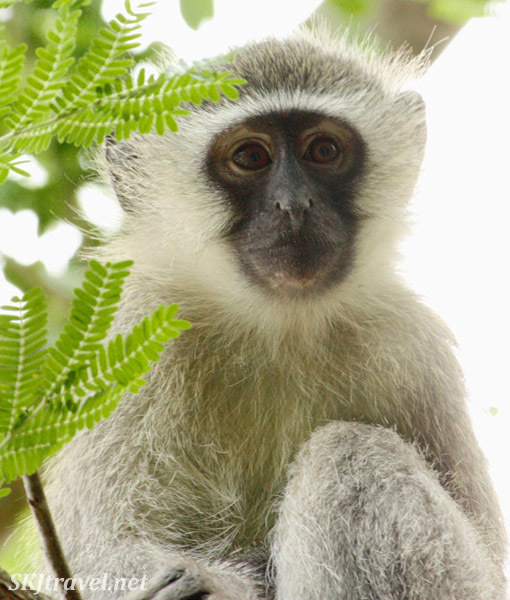 And some vervet monkeys in the trees. They are apparently a constant nuisance at camp, rather like raccoons, getting into everything. But they’re just awful darn cute (rather like raccoons). Saw one elephant today as we were stopping at a ranger’s complex, there was an open soccer field the elephant was sauntering through. After dinner we sat around the campfire as Venus rose tethered to the moon. As I lie in my tent in the dark typing, elephants are eating at the perimeter “fence” 30 meters away. The sounds of them breaking off the tree branches seems more as if they are 3 meters away. And now the hyenas have started in, breaching the still night air with their eerie calls. I’m not in Kansas anymore. Next Day. 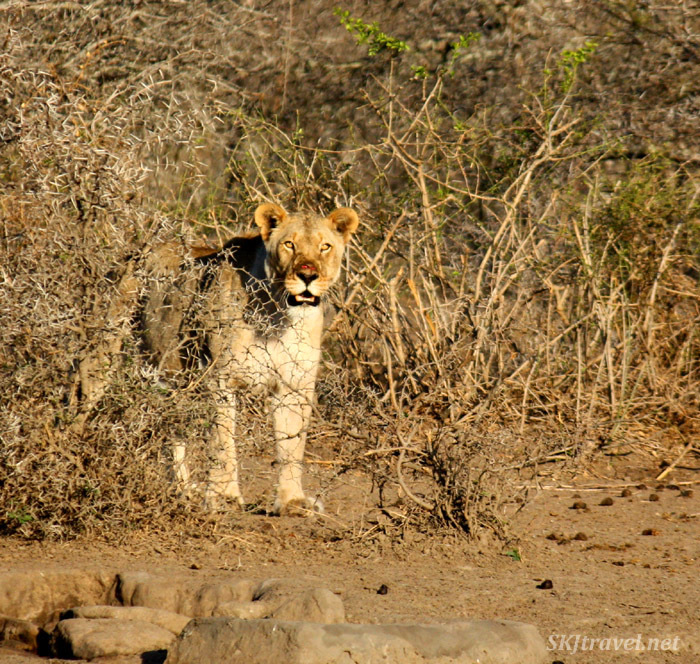 Later on in the night I was woken by the sound of a lion huffing along the perimeter fence. I lay awake trying only to appreciate the noise and the knowledge of such a powerful beast just outside my tent; but also couldn’t keep out wondering thoughts about the efficacy of 4-foot floppy-wire fences and mild electrical voltage (which in fact was non-existent voltage). Today I got up at 4:15 a.m. and walked my first transect with my Zulu guide, Vusi, an affable fellow who is trying to learn English but he wants to learn French. “I have a dream to travel to America, British and France,” he says. I taught him some words in French and he taught me some in Zulu. He asked about my flight to South Africa, how long it was. When I told him I was on a plane for 18 hours, he was flabbergasted. I think he felt slightly deterred -- feeling that even if he could somehow get money for an airplane ticket someday, the flight time might be insurmountable. 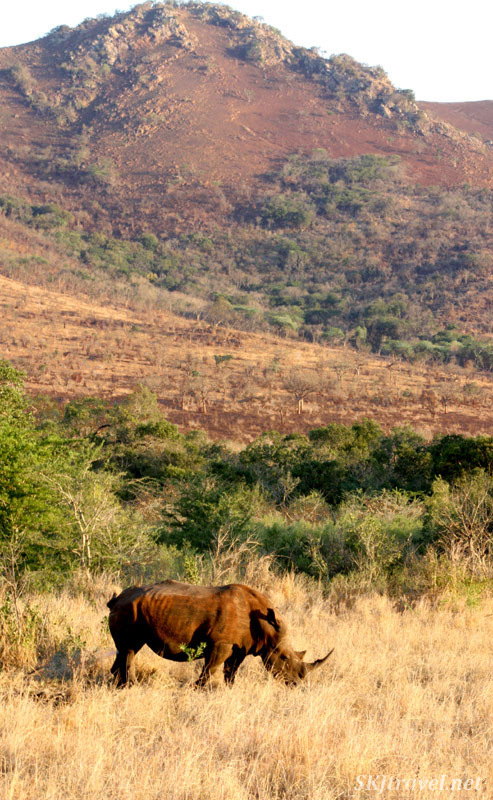 I had only one animal sighting, a not very exciting one of cape buffalo. But the terrain I hiked over was very interesting and extremely varied over a mere 3.7-kilometer stretch. Driving to the drop-off sight, we had to stop suddenly for a hippo crossing the road. He was clipping along fairly well for such a giant beast; then we noticed 2 juvenile hyenas following closely behind him. Walking the transect, we passed by numerous hyena dens dug into the ground. You can tell which poop is theirs on the ground because it's white.The weather is far hotter today. It is nice for drying out my soggy tent and belongings, but is a bit oppressive otherwise. But I guess it IS Africa. 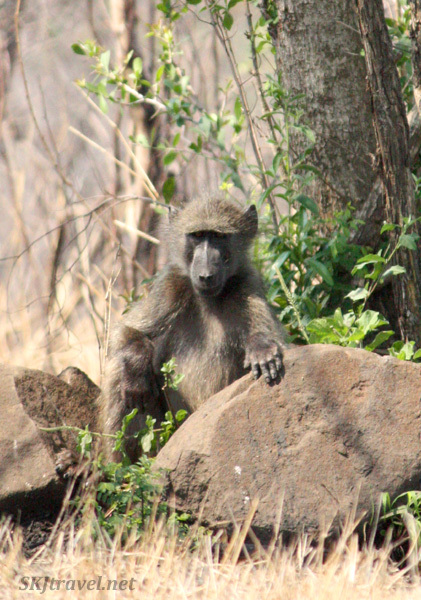 In the afternoon we watched a herd of zebra, some nyala, a waterbuck, and a large troop of baboons saunter down the dry riverbed outside our camp. 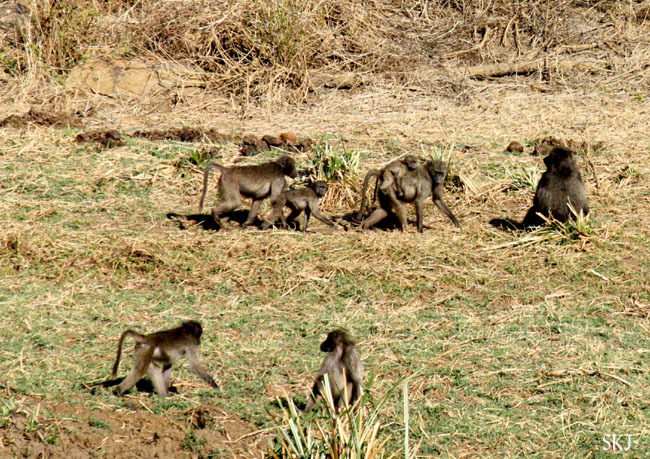 The baboons were great to watch; there were several youngsters and one particularly tiny baby who was just all romper-roo playing around. The troop would move down a few yards at a time and then sit down and pair off for grooming or wrestling. Then after about 10 minutes or so move a little further down and pair off again. The dominant male was a busy beaver wooing the ladies. Went for a game drive later in the day. Got very close to some white rhinos and quite a lot of other game. Notice in the bottom photo of the set the oxpecker kindly cleaning out the white rhino's nostril for him. NCM has a great knowledge of the animals and it’s very informative taking a ride with him. For example, I learned that rhinos are born with patches on their foreheads kind of like the cuticle of a fingernail; it’s from this patch at about 3 months old that their horn emerges like a giant fingernail growing. 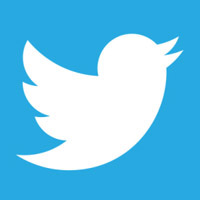 I went to sleep at night with a chorus of bugs and birds serenading me. So pleasant. The next day, my second transect was longer and more tiring because of the length, though the terrain was easier than yesterday despite the number of long treks uphill and downhill and uphill again. My guide was convinced my GPS was incorrect and that when it told us we had 1.6 km left, we were in truth just about there. As we crested the ridge to find that the GPS was the correct party, he cursed several times and we trekked on. Unfortunately, as he had already radioed in to our pick-up that we were imminently about to finish the trail, when we in fact had almost another hour yet to hike (pretty much all uphill), it set off a morning of chaos for NCM trying to arrange the other pick-ups when we didn’t show up as advertised. Walking down one particularly slippery talus slope, my guide slipped and fell and dropped his rifle which fell on the ground pointed squarely at me. Good thing he had the safety on. The ultimate result for us was that our ride left to pick up everyone else and we then had to wait 1.5 hours before getting picked up. We sat in the bushes above the road “like lions,” we said, and waited for the tourist trucks to pass by and see if anyone noticed us. Only a couple people did, but they were very surprised and did a double-take at the sight of two humans sitting in the bush among the wild safari critters. We are a privileged bunch to get to walk in the park, no tourist could manage to arrange this. My GPS-challenged ranger, below. You can read the whole little tale of our "adventure" here in the Tuesday Tale, "Curses." Completely random note: Camp food, by the way, is delicious. My transect was a very nice one with lots of wildlife. At one point we summited a ridge to find ourselves on a lovely high plain, very much like the iconic African plain where all kinds of different animals hang around together in the grassland, a few acacia trees scattered about. There was a herd of zebras scattered widely, a herd of buffalo, one of wildebeest, some warthogs rummaging about, and a grumpy black rhino. Most black rhinos are a bit grumpy. 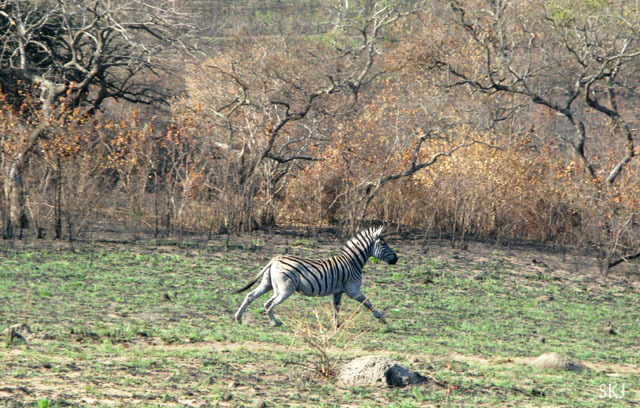 This one was munching grass and then all of a sudden just decided to charge the herd of zebra. My guide and I happened to be standing pretty much directly in front of the herd, therefore pretty well directly in his path. I grabbed BJ's arm in alarm. He unshouldered his rifle and told me to quickly walk back toward the nearest tree, which was some significant way behind me. 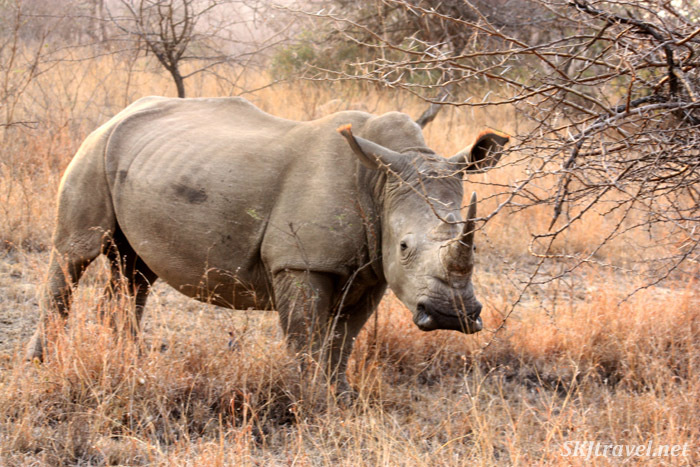 I did not want to take my eyes off of the rhino, so I started stepping backward and bumped into a thicket of thorn branches. So I’m flailing around trying to unhook my clothing from the thorns and creating a terrible racket. I am not at all being quiet. Rhinos have terrible eyesight but they have other good senses, and those aside, I was still directly in his line of sight at close range. But my stout ranger, BJ, headed off the rhino by fiercely banging on his rifle, and we continued, looking over our shoulders until the rhino was out of sight. 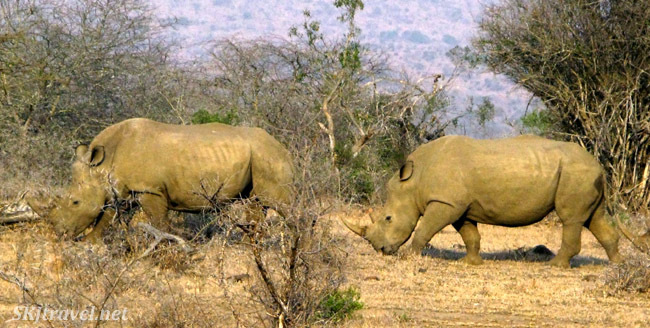 Hluhluwe-iMfolozi is renowned for its white rhino population, for it was the flagship park in recovering the white rhino population from near extinction in the 1960s and 1970s. 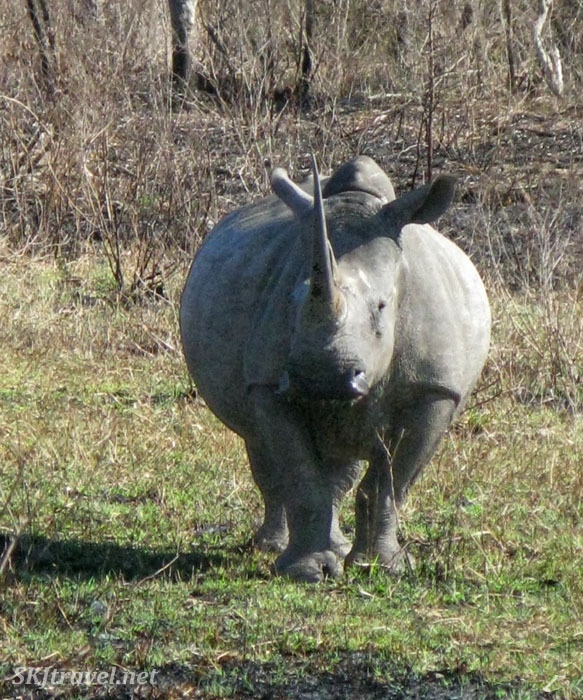 The white rhino is the park's "mascot." And so I had the pleasure of seeing many, many white rhinos in close proximity. Black ones, too, but far more whites. The black ones have their ears clipped for identification and whenever one of my rangers saw one, he had to radio in the location. 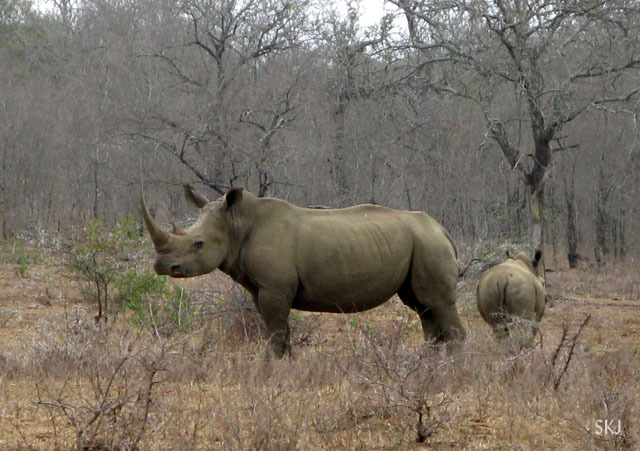 The first two guys below are black rhinos, and the one in the second photo is a white. The differences are mostly a product of their different diets which result in different types of mouths and head shape ... the blacks having smaller heads and more beak-like mouths for browsing and the whites having large head with a shovel-type mouth and broad lips for grazing. It was a very hot day so after lunch our camp manager took us to the swimming pool at the hotel that is within the park. We were supposed to have other researchers come to our camp for a barbeque, so we bought extra food supplies and beer. In the end, the other people got 3 flat tires on their vehicle. So it was just our group. NCM and I stayed up much later than the others finishing off an assortment of liquor in the kitchen. The reward for this was that the elephants came to the riverbed just outside the camp fence, and we were the only two who got to see them. Really. It wasn’t just the cane juice. “Do you want to see the elephants?” he asked when we heard the unmistakable rustle of reeds and tree branches. Of course I did. “OK, but you must do exactly as I say,” he said as he slipped off his rubber flip flops and grabbed the spotlight and the battery and cables, and I followed close behind as he walked quietly barefoot across the grass and thorns up to the nearest tree. Elephants don’t like the light directly in their eyes, it will make them a bit bizerk, but if you shine it down at the ground just near them, they seem quite unfazed. So we watched a herd of them pass through the riverbed, magnificent in the darkness, traveling through the night. The next day, a mother elephant and her calf came to the fence during the day for a brief snack. 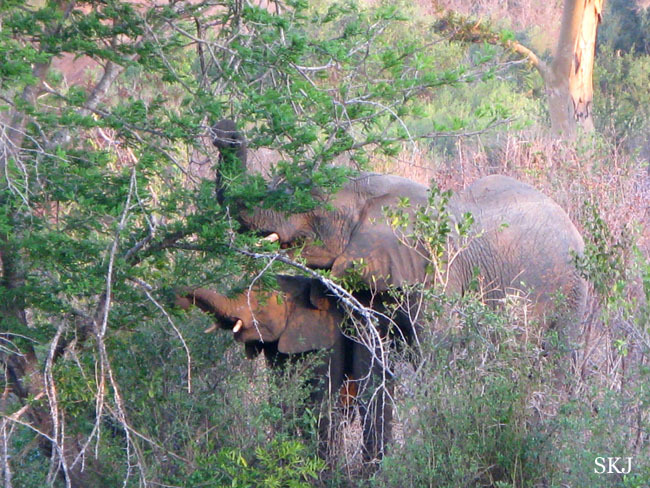 The Zulu field rangers, NCM says, are terrified of the elephants. 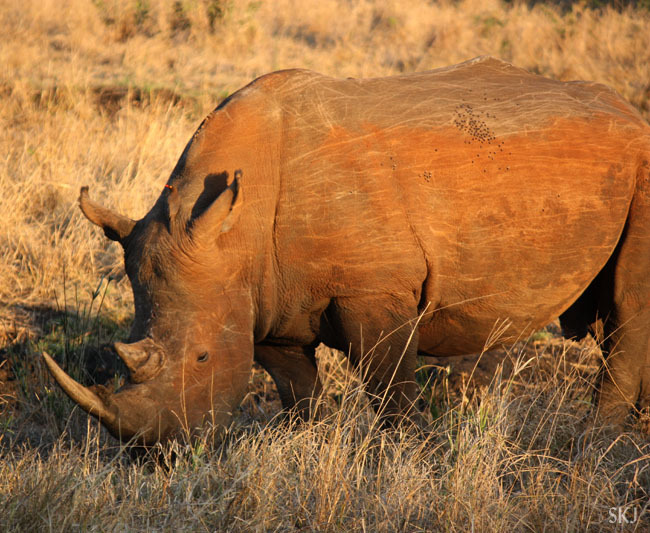 Black rhinos, buffalo and elephant all inspire great caution and fear for they are the most dangerous. 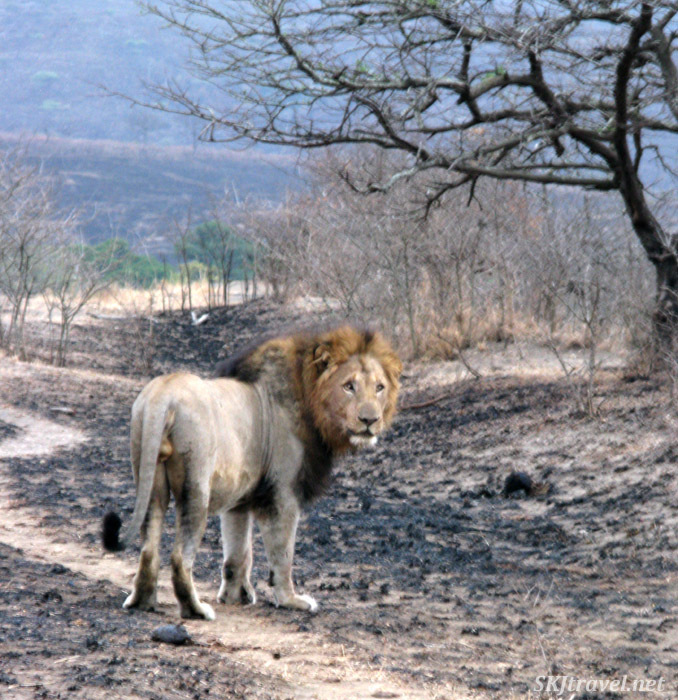 Lions are not much of a threat during the day (relatively speaking). At night, the lions are a different creature. They are far more bold and have no fear at night, and they will attack anything readily. One of my field rangers asked me, which do you think is the king of the forest, the lion or the elephant? Because I already knew about the rangers’ fears I said, “elephant.” “Yes, that’s right. The elephant is the king of everything.” NCM said one ranger on another EW team told his volunteer that if they came across an elephant, “I don’t know what you’ll do, but I’m going to run away.” He was released from EW’s employ after that; you can imagine the poor volunteer trekking through the landscape knowing he’s on his own if actual danger approaches. NCM says many field rangers will not try to circumnavigate the elephants if they come across them on the transect. They will simply turn around and go back to the beginning of the transect. They want nothing to do them. They’re quite terrified. Read about one ranger's incident with a terrified volunteer in the Tuesday Tale, "Run!" Last night, there was a poacher in the park. 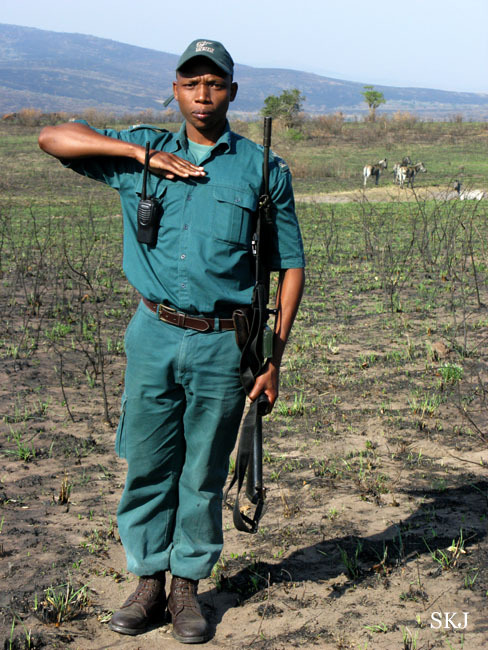 The rangers exist in the park primarily as poaching deterrents. 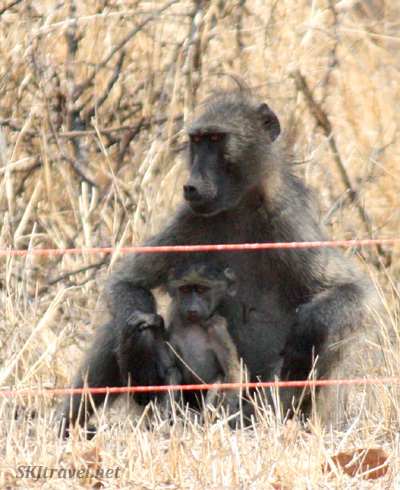 They monitor the wildlife, too, but this is secondary to their role in anti-poaching efforts. They are authorized to shoot poachers on sight. 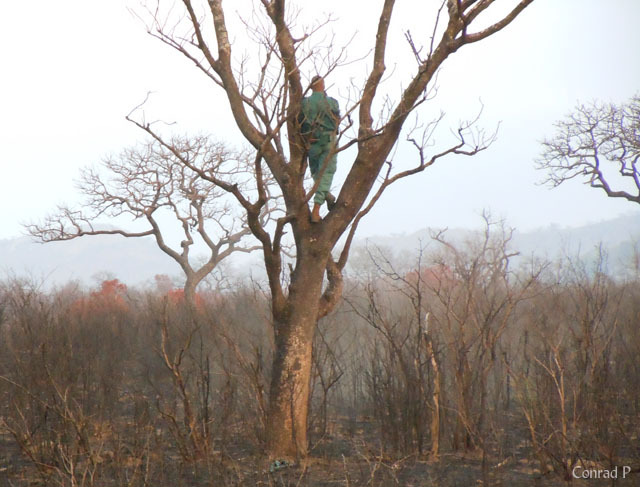 The rangers were tipped off about it beforehand and so they went out looking for the poachers. They didn’t know how many there would be, but it turned out it was only 1 man and he only shot 1 warthog before the rangers came across him. He fled and got away. But the rangers followed him to his house, and though the man fled his home, the rangers will now call the police as they found all the evidence inside the man’s home of his poaching. Hurray. One for the good guys. 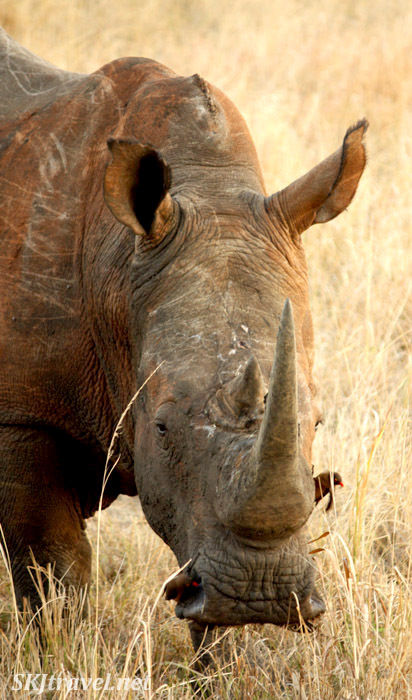 Sadly, rhino poaching has skyrocketed in the last three years. I feel more and more blessed as time goes on to have seen so many rhinos. The rate of poaching now is absolutely sickening. I’m now in South Camp, a vast downgrade in character from North Camp. And quite a bit hotter in climate. However, the animal sightings are more plentiful here. Heat is a bummer. Finishing transects walking uphill in this heat is quite draining. But the large number of animal sightings is rewarding. Today I had my next scary rhino encounter. 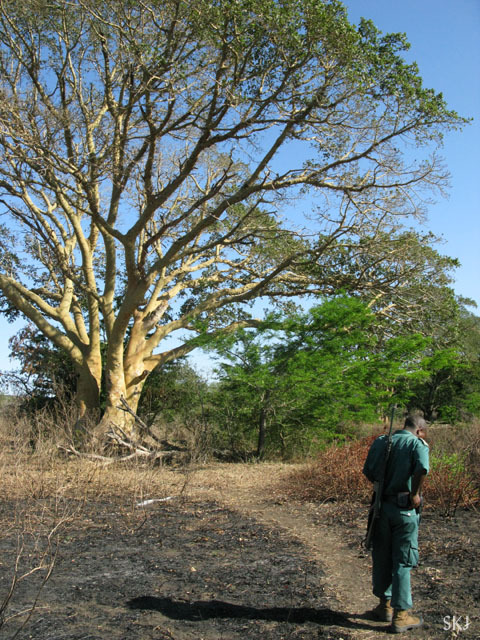 I must admit, it takes a wee bit of willpower to obey your ranger when he tells you not to run but to stand behind a puny 6-inch diameter acacia tree while an adult rhino trots straight toward you from 40 meters away. Consider that the beast himself is 3 or so meters long, and you can imagine how quickly he can cover this distance. As soon as my ranger, Zenzele Tembe, successfully headed him off we turned to look over to our right, and found 3 menacing water buffalo at close range looking sternly at us as though they were about to chase us off in the same manner. But again, Tembe scared them away. And all was safe. After I recorded these two animal sightings there then came into view a herd of impala. As I was looking through the range finder to measure their distance to us, Tembe asked me, “are you OK?” “Yeah, fine,” I said as I saw him grinning. I wasn’t sure why he asked this, but then I realized my handing was shaking just a little as I was holding up the range finder. The shot of adrenaline hadn’t yet dissipated. Naturally it was going to be different seeing the magnificent African animals in person on foot in their territory than seeing them as I usually do, in the zoo. That’s the whole reason I came here. Rhino and elephant encounters are probably easiest for you to conjure some vicarious experience with; hyenas and lions too, perhaps. But it’s the unexpected moments that are really magical. Like coming upon a lone male giraffe towering serenely above you. He looks down at you, you look up, way up, at him. Then he turns and gallops away with a regal fluidity that is hard to believe in this thorny land of twisted acacia, so that it’s like a dream and he’s galloping off in slow motion. Pure loveliness. Warthogs are surprisingly fun to run across. Not sure why. They’re much larger in person than I imagined. They have a very silly charm about them. Yesterday was our vacation day and we left the park to go to St. Lucia where we took a boat ride up an estuary to see crocodiles and hippos in the water. 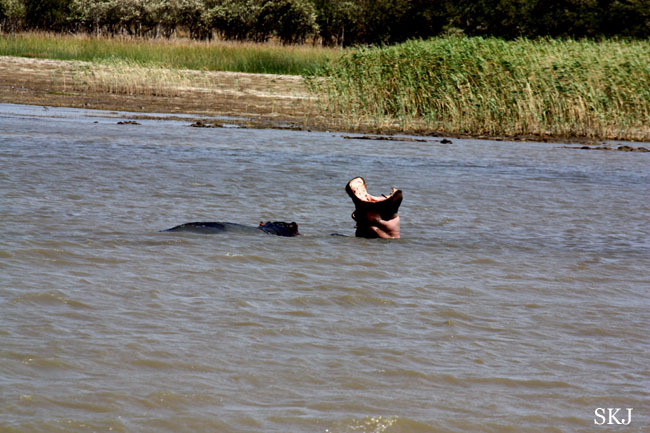 Saw one really monster of a crocc and a good number of hippos, including some adorable babies. Then we went to the beach there. It was a magnificent beach as far as beaches may be judged on their quality and quantity of sand, the stretch of their horizon, the color of water and the nature of the waves. However, it was also devilishly windy and at first the water did not seem inviting. However, after walking down the beach in the surf a ways, it became an excellent temperature. I didn’t put my swimsuit on because I didn’t think I’d get in, but really I should have as I ended up quite wet in my clothes. Since being relocated from North Camp to South Camp, as all volunteers are rotated through, I’ve been desperate to get back to North. The camp is infinitely more pleasant than South. NCM promised to work on a way to transfer me back. Meanwhile I sit here in my stifling hovel waiting for the air to cool off enough for it to even make sense to take a shower so I won’t just sweat up my clean body immediately and render the shower useless. Tomorrow is predicted to be even hotter than today. It does fill one with a bit of dread. I had mentioned at North ordering a package of marshmallows to roast over the pleasant campfire we had each night. Despite NCM’s claim to have ordered them, they never came. That is, until after I’d been transferred. I just found out those marshmallows are sitting over there without me, imminently about to satisfy someone else’s craving for their sweet gooiness. Boo. Sigh. There have been problems with lions infiltrating South Camp… so there are bright propane lights outside our huts and a huge campfire in mid-camp with the amusingly incompetent Wilson on guard throughout the night. The night watchman who tends to mostly watch the inside of his eyelids. It’s a funny existence here in the park. We are fenced in, not allowed to walk beyond the camp perimeter, are driven everywhere we go and are always accompanied by armed guards. One does feel, as Conrad said, not unlike a prisoner. In the down time in the afternoons we are confined to camp quarters, something I think most people didn’t quite expect. 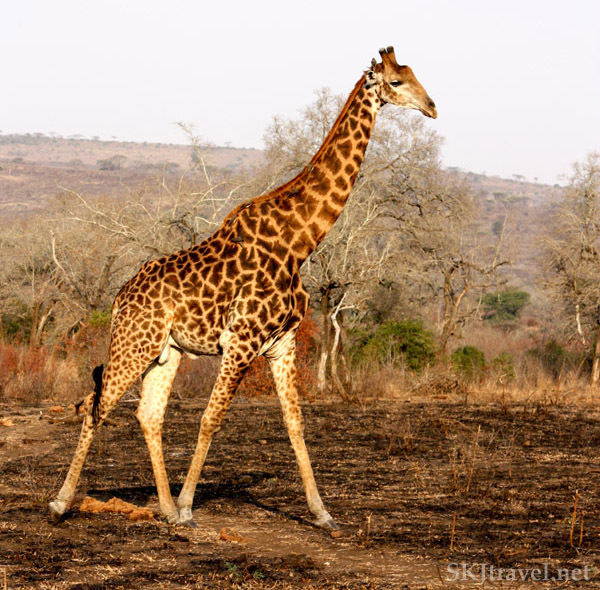 You can’t just go wandering willy-nilly through a Big 5 game park (i.e. parks with five most dangerous animals: elephant, black rhino, water buffalo, lion, leopard). It’s mostly fine, though sometimes it does make you feel a tad claustrophobic. The water situation is very desperate. The rivers are completely dry. It’s rained very little since we’ve been here and we’ve watched the puddles that were in the wide river beds when we first arrived evaporate away. The beds are all dry. The place where water is fetched for the south camp has gone dry. They keep digging and cannot get to water. So we and the field rangers are all on water restrictions here at South Camp. I overheard a conversation over my field ranger’s walkie-talkie about the situation and the words “terrible” and “desperate” were used. There is a leak in our water tank, which of course doesn’t help our situation, but the animals are now drawn by the dozens to it. Yesterday we had nyala males and females, zebra, and loads of baboons all together at camp when I returned from my transect. Despite hopeful bush signs of rain today, such as the “rain bird” singing and elephants coming down from the hills, the clouds dissipated by mid-morning. Yesterday we visited the local school which included children of all ages. Some too young to actually be in school but their siblings are there, so they tag along, basically free daycare. NCM said, “you want to know something really depressing, is that 25% of these kids have AIDS.” The kids stood outside in the dirt courtyard and performed several dances, different ones doing different dances. They don’t learn these in school, rather through their tribes. In these rural areas, they still perpetuate many traditional ceremonies and customs such as the dances, also things like circumcision rituals. 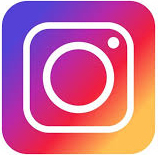 But the ways of the trackers and the bushmen will soon be endangered because now when the kids go to school they are not out learning about surviving in their environment, and tracking, hunting, identifying flora and fauna, utilizing their natural resources, etc. We saw a little domesticated dog inside the park today. The ranger was worried perhaps it was a dog that belonged to a poacher. NCM said another irony is that the park rangers have basically worked themselves out of work. Not really, but their days are more idle now because of their presence in the park, the poachers are somewhat discouraged from entering so the rangers don’t have so much to do. Sadly, the poachers have vastly superior financial power than the parks and rangers, so even if caught and jailed, they can typically pay the high bail and be out again. They have modern and very high-tech equipment they use in their operations because they can afford it, whereas the parks and rangers have a pittance of a budget and cannot possibly counter the sophisticated attacks of the poachers with their limited and antiquated resources. Rangers here in HiP are now carrying pepper spray with them, as apparently there was a hubbub over the fact that there was no intermediate action for them to take with poachers; it was either let them escape or shoot them down. Now they’re supposed to use pepper spray first before shooting to see if the poachers can be subdued this way. But one of the rangers the other day tried spraying it at an elephant or rhino (can’t remember which). Naturally, it would have had zero effect. Funny, but you can see it making sense to people. I have started asking my guides how many cows they have. People here don’t put money in banks so much as they buy cows. NCM told me this, but I wondered how true it really was, if it was just very rural, maybe uneducated, tribal people. So one day I asked a guide if he had cows and he said yes and told me the number, saying he didn’t have too many because there wasn’t much room in the town where he lived to pen cows. He asked if I have room for my cows in the city in America. Had a long talk with “Blessing,” the English translation of his name. Telling me of his woes with his cheating wife whom he has now divorced but she doesn’t know that she is divorced. She does not have to sign any papers finalizing the action; after being served papers announcing Blessing’s intention to divorce, she only need sign a paper if she wanted to contest the divorce. She didn’t sign it, so he went to the court and just got the divorce by himself. He feels a bit smug over this, though he says it cost him a lot of money for the paperwork and lawyer, and if he’d known how much it would cost, he wouldn’t gone through with it and just let her cheat on him and he’d find a new girlfriend for himself. He has in fact done this, the nurse at the HIV clinic where he got tested caught his fancy. So he came back for a second test. She said, “but you already know the result!” And he said he didn’t believe the result. Cute. Spring solstice. In September, of course, down here. I tried to talk our South Camp manager into letting me and my buddy Conrad sleep on top of the water tower. But the water tower (with a flat cement top), where we spent a fair amount of time during the afternoons overlooking the landscape, is outside of the camp’s electric fence. 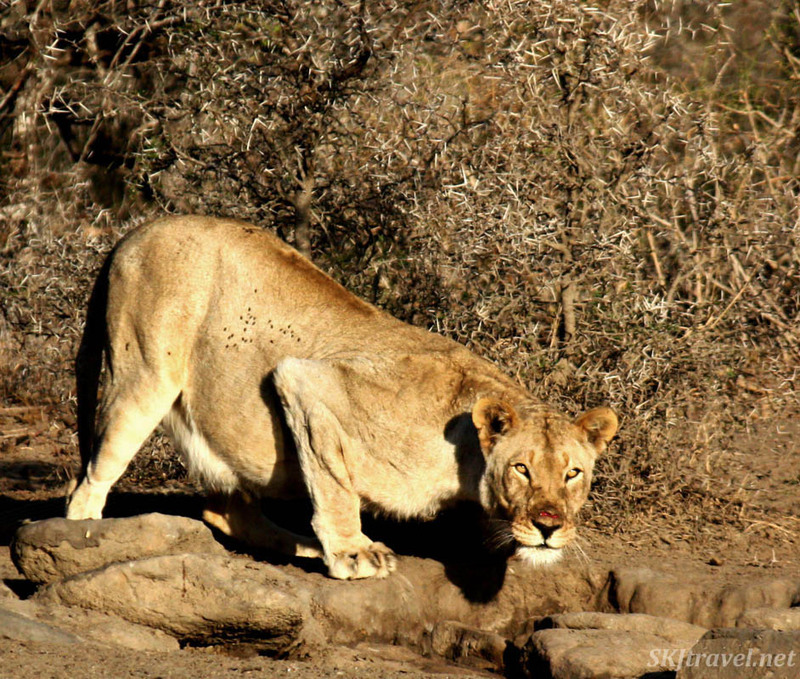 The camp manager wouldn’t let us take our chances with the baboons and leopards that could climb up and nibble our ears…. Plus there would have been no accessing the bathrooms (though we could have just peed off the water tower). The moon at solstice was magnificent. We went to the park’s lodge for drinks and socializing with the volunteers from the other camp, and the whole ride back home I watched the giant moon as it changed from orange to yellow to silver. My second-to-last transect, I had walked for 3 kilometers without seeing a single animal. Even my ranger commented on the unusualness. We were walking along a low open woodland plain and came around a thicket where suddenly the water table must surge upward for there was a green valley with ample grazing and green leafed-out trees, and it was like walking into the Lost World or something. 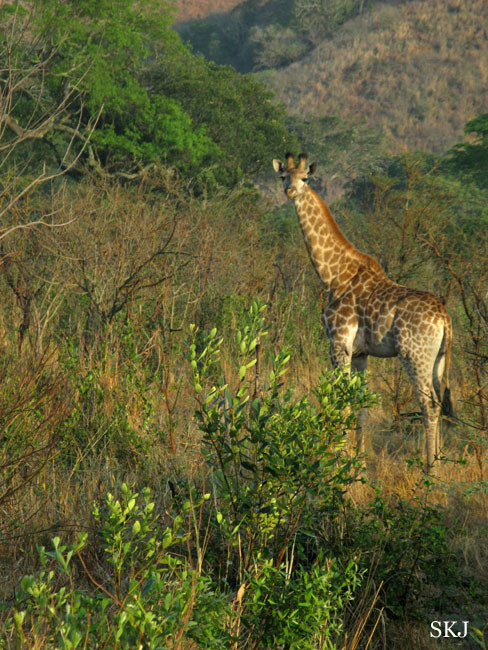 All the particularly pre-historic-seeming animals were hanging out peacefully together – giraffes nibbling high in the trees, white rhinos snuffling the low grasses into their giant square mouths – impala and zebra standing in their own groups, zebras beneath a clump of trees and impala in the open field. It was a rather magical moment that could only have been experienced on foot. 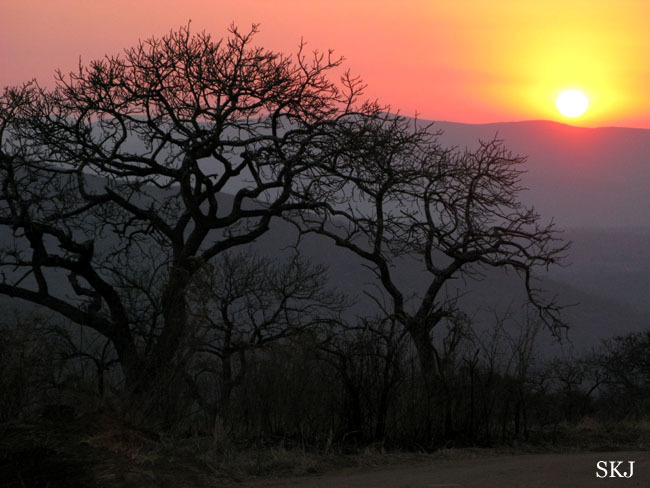 The three most coveted sightings within the park were leopard, cheetah and wild dog. Most volunteers saw one of these, no one saw all of them. 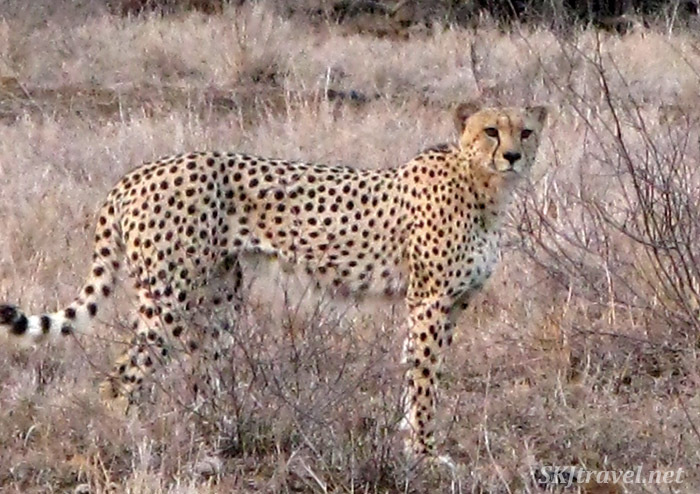 My big score was the cheetah, on the very last day shortly before reaching the start of my transect. So only my ranger, our driver and I saw it. Very close to the road, he was unfazed by us. He had been lying down under a tree and lazily got up when we stopped the vehicle next to him, then slowly sauntered off. The day before, the south camp manager took us to a blind at a water hole to watch for animals. 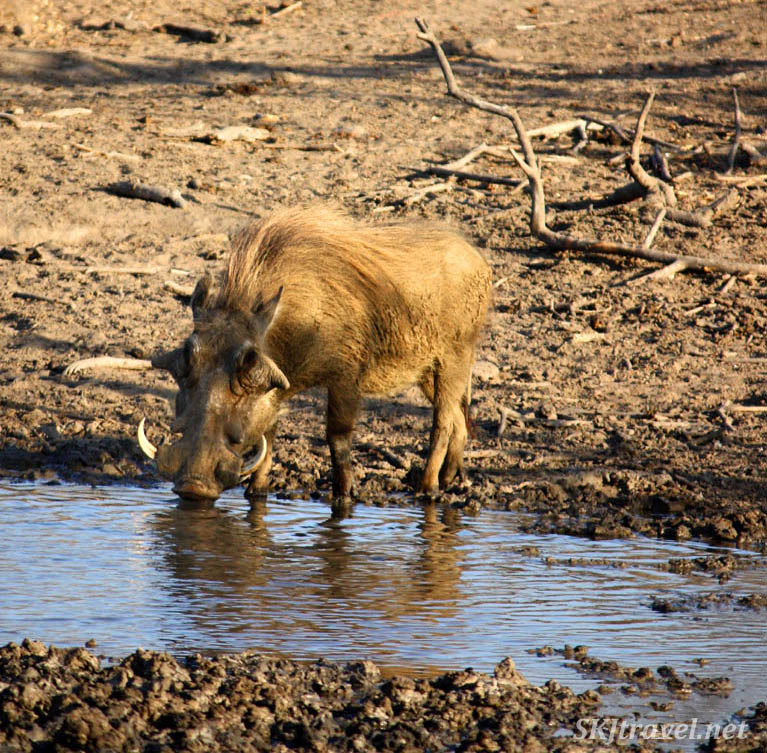 We didn’t have too long to stay there, but in that time a warthog, a nyala and a female lion came to the hole. I didn’t get very many lion sightings, so that was a treat. I ran across 2 while walking on transect and saw one close up from the transport vehicle. On the last day, we in South Camp decided to have a safari competition on that day’s transects. We constructed a somewhat elaborate scoring system based on the number of sightings on the transect, the sighting of rarer animals (mostly carnivores, which we were not taking data for in the EW project; we only took down info for the herbivores in the park). 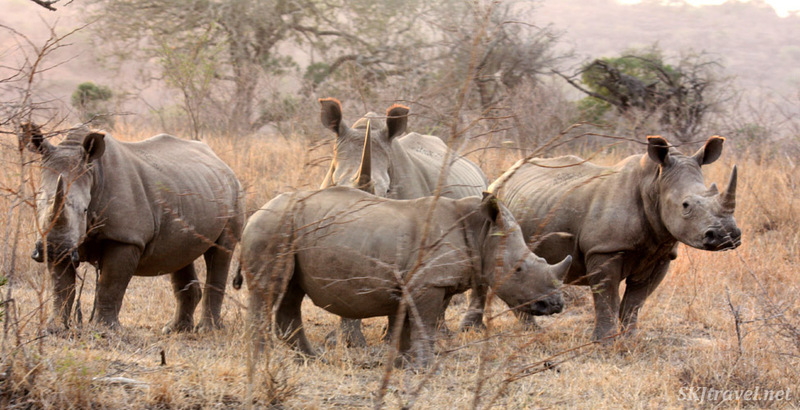 By that time I’d walked 11 transects and on 9 of them had seen white rhino. The only two I didn’t were the 2 times I walked T1 (typically we didn’t walk the same transect twice but there was a mitigating circumstance one day). 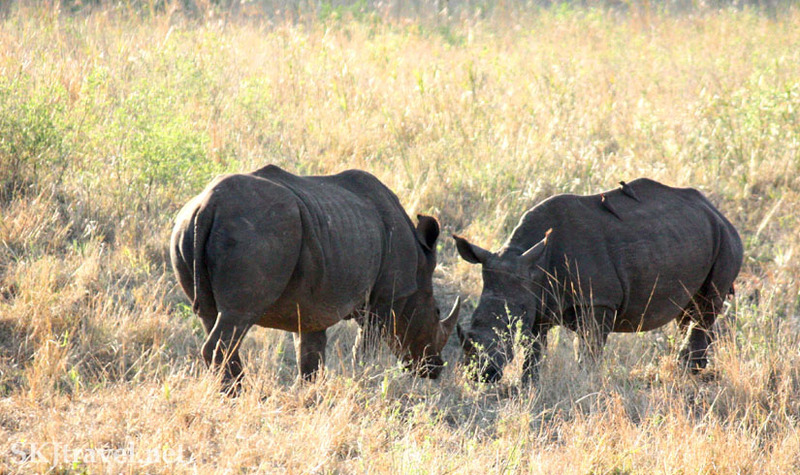 So I was banking on seeing a white rhino (the more docile of the two species; black are the grumpy ones). The contest was based on guessing the number of points you would score. 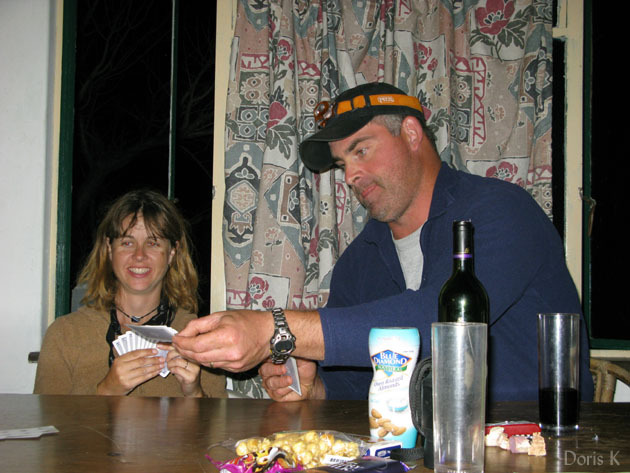 This came about from us having been playing cards at night, got to thinking about games in which you have to bid on how many tricks you think you will take at the start of the game. 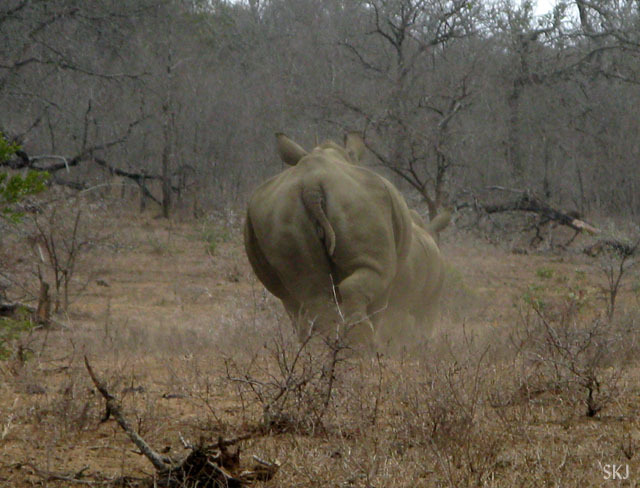 So I factored in a white rhino sighting. And the silly critters betrayed me. Had I seen one I would have been 1 point from my “bid,” thereby winning. But they all hid from me. Oh well. Seeing the cheetah that morning made up for it. 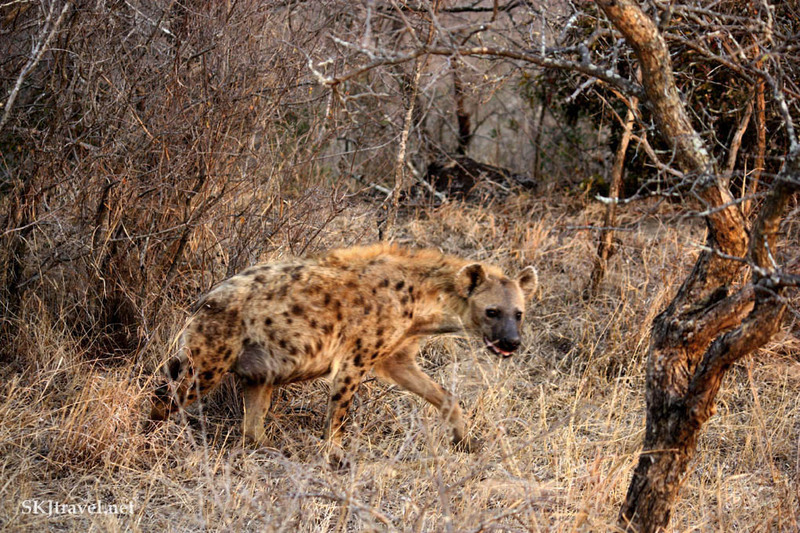 I had also taken a bit of a chance and figured in a hyena sighting which I did in fact make. One thing the contest showed was our beginning to understand the park, the differences between north and south, the probabilities of seeing certain animals, etc. Those white rhinos were just toying with me. They should have been there! Some random interesting tidbits: Lions do not eat the stomachs of their prey. You can tell if a kill is made a lion or not by this evidence, if the stomach is lying some distance away. Vultures and hyenas will come and eat the stomach, but the lions don’t like it. Warthogs don’t cause damage with the large curly tusks that you see coming out of their mouths, but rather with their sharp bottom incisors which, when they close their mouths, they rub against the big curly tusks which act like a whetstone. So the two smaller tusks on the bottom jaw are what do the stabbing and killing. I was allowed to go back to North Camp for the last night, since I didn’t have to get up and do a transect the next day, rather just go to the airport. It was a great gift. Was a beautiful, crisp night, perfectly peaceful. I slept in my sleeping bag on the ground somewhat near the perimeter fence. Earlier when I’d asked about it, NCM said, no it’s too dangerous. But when I laid out my bag with a smile and a plea, he said, “It’s your grave.” And let me stay. I will say that when I had to get up to use the loo, I was very tempted to take my sleeping bag up and store it on the kitchen table to make sure no spiders, scorpions or snakes crawled inside during my absence. But I was brave. I really appreciated the opportunity to sleep out in the open beneath the stars, feet away from the riverbed where all the animals pass, in the night air alive with insect and frog calls. Out in the bush. There is no more peaceful feeling, I guarantee it. These are images taken from a blind at a watering hole in the evening. This lioness had a pretty badly injured nose, she'd clearly recently had a scrap with another lion or with a feisty prey. 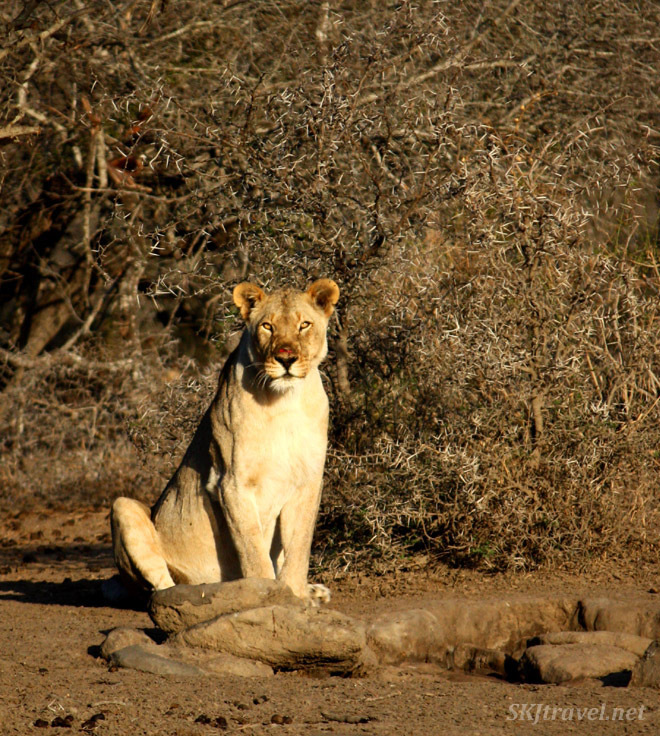 She was alone, it's possible she had a row with her pride; occasionally lionesses are ousted from their group. 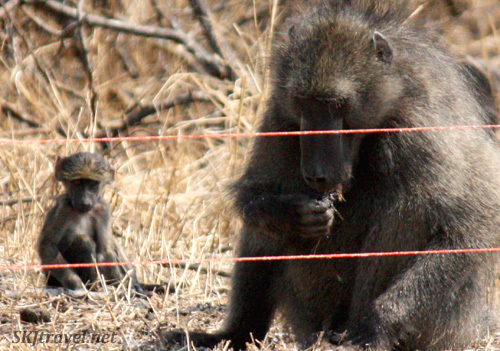 There’s just something adorable about little baboon hands. 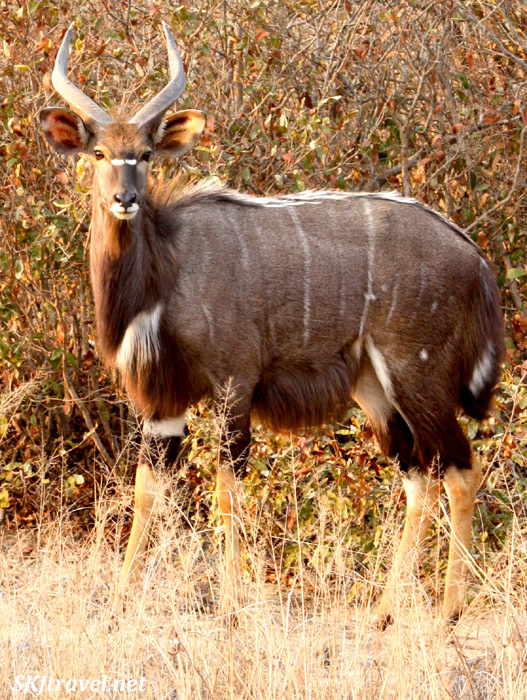 Nyala, one of the common antelope species. 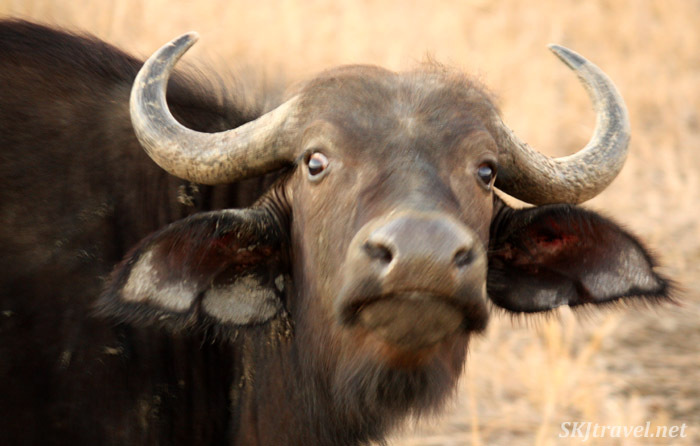 Crazed-looking cape buffalo; I just love his expression. Some of his mates got into a horn-locked tussle; he just stared at me like maybe he wanted to tussle with little ol' me. 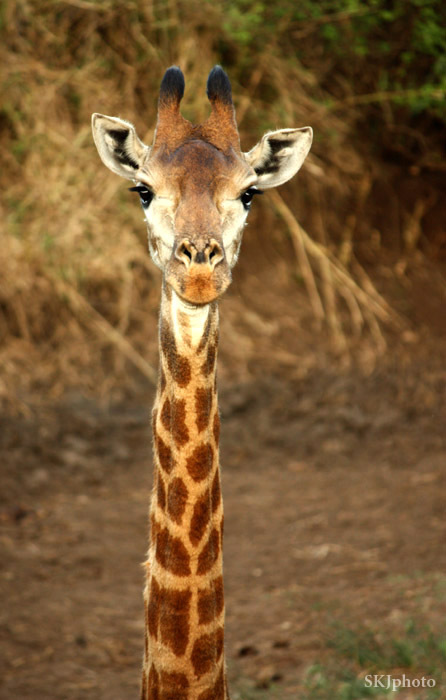 Vs. sweet-looking giraffe, such a gentle countenance. 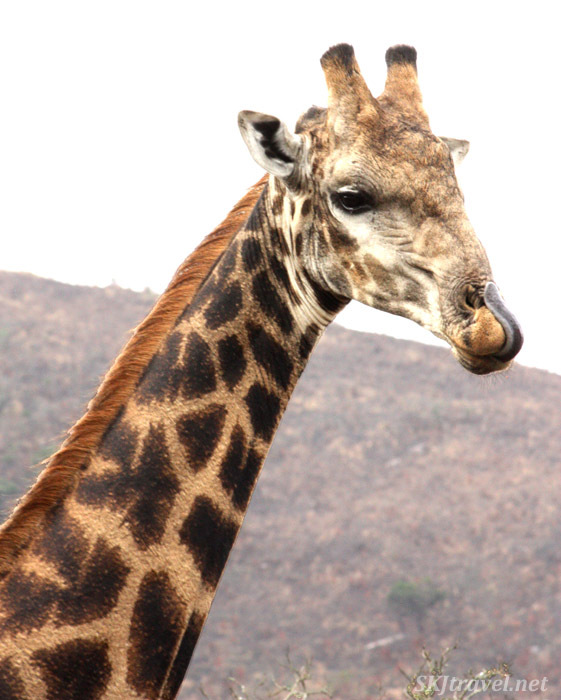 I was happy to find after looking more closely at my photos that I managed to capture the iconic shot of a giraffe with its long tongue licking its nose. I like the textures you can see on this first fellow below. The red color comes from the kind of mud he’s been recently rolling in. Also the evening light was nice. Notice the oxpecker on his forehead between his ears. I like this series of rhino photos just because of the personal experience it evokes… the white rhino eyes us – heartbeat elevates – ranger scares him off – heartbeat lowers. A situation experienced several times over. 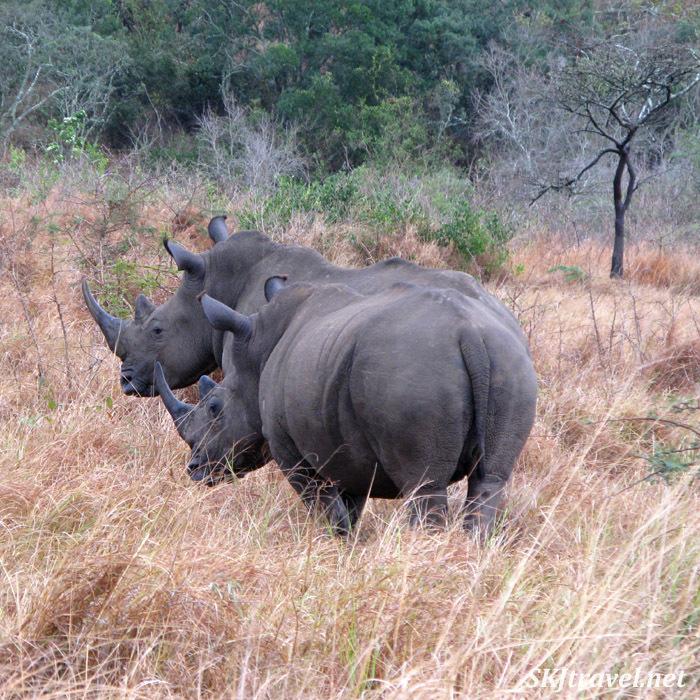 Had this been a black rhino, I would not have taken the time to stop and snap some photos. 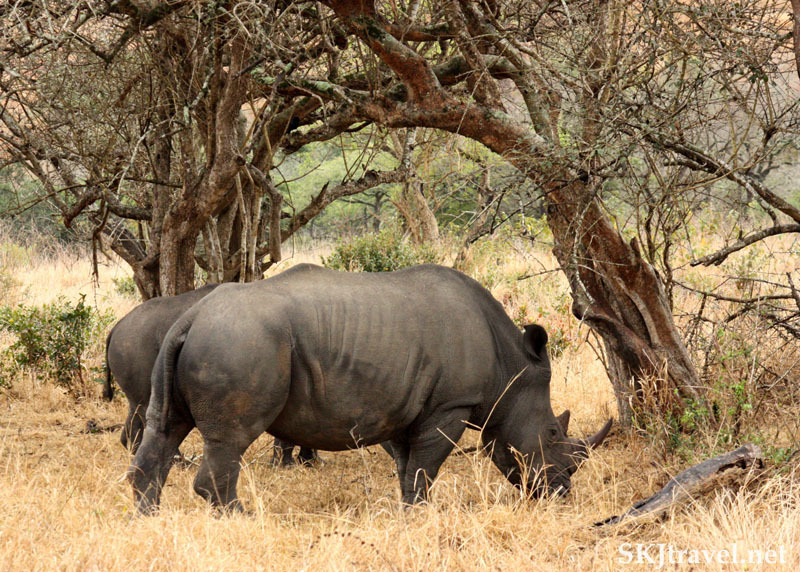 White rhinos are a bit less cranky, though no less intimidating when staring them in the eye from 15 or 30 meters away (the typical space between us when encountering them in thick woodland). This photo was taken by fellow volunteer, Conrad. 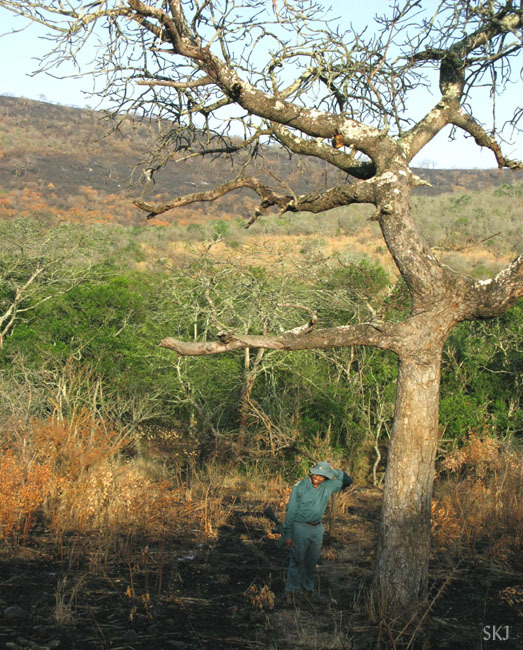 Conrad is in a tree while taking this photo of his ranger who is similarly treed by a charging rhino. I love the photo not only for its depiction of the ranger, but I think it’s hilarious that while treed by this dangerous animal Conrad has the presence of mind to dig out his camera and take some pictures. But I guess I had the presence of mind to take the photos above. 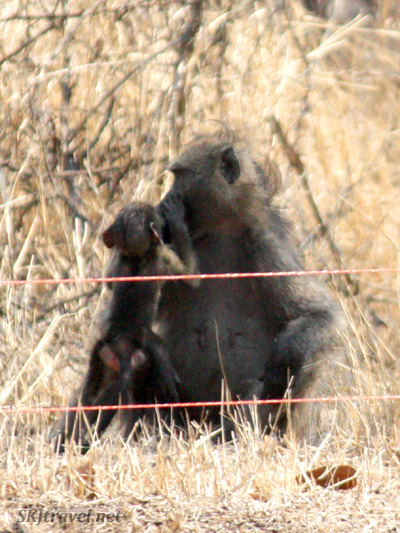 Just can’t get enough baboons. These are from a large troupe that passed right outside North Camp. Notice the little baby on his mother’s back. I like this picture because it kind of epitomizes the slinky nature we associate with the hyena. We startled this guy who had been lying low in the bushes when we passed by him. Pretty good feat of mine to get my camera out and get a shot off so quickly. At South Camp, we played “hearts” on several occasions in the evenings. Conrad insisted that I represent this facet of our camp life; he has the foolish delusion that he is a better player than I.